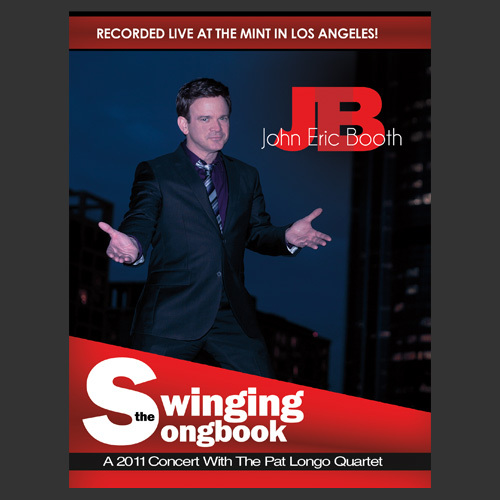 Swinging The Songbook – Concert DVD – John Eric Booth Entertains The World! 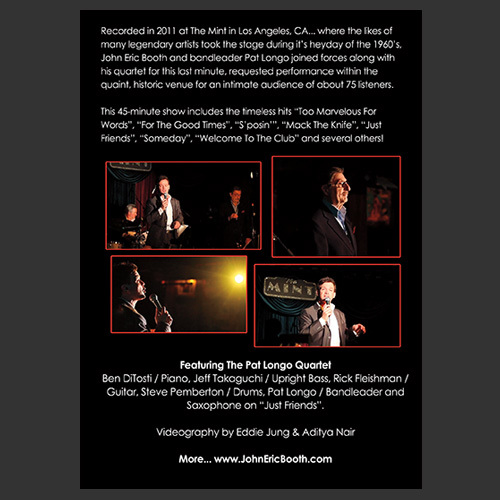 Recorded in 2011 at The Mint in Los Angeles, CA… where the likes of many legendary artists took the stage during it’s heyday of the 1960’s, John Eric Booth and bandleader Pat Longo joined forces along with his quartet for this last minute, requested performance within the quaint, historic venue for an intimate audience of about 75 listeners. This 45-minute show includes the timeless hits “Too Marvelous For Words”, “For The Good Times”, “S’posin’”, “Mack The Knife”, “Just Friends”, “Someday”, “Welcome To The Club” and several others! Recently remastered video and audio for the best possible quality.